Python is great for many things. One thing, in particular, is hacking together code to develop and deploy simple web apps for particular functions or utilities you may need in your business. In this tutorial, I’ll be going over several how to integrate Twilio’s Programmable SMS systems using their Communications REST API, Python’s Flask micro-framework, and ngrok, a cloud service that exposes local servers behind NATs and firewalls to the public internet over secure tunnels. Outbound SMS — How Does It Work? 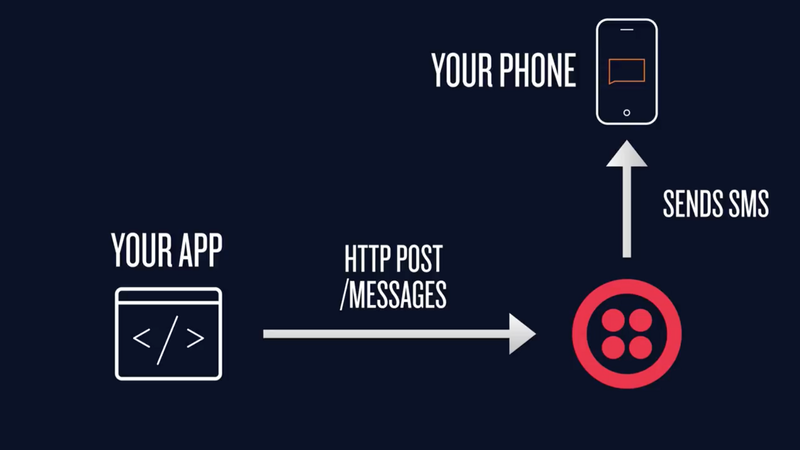 Using Twilio’s REST API, you can send outgoing SMS messages from your Twilio phone number to mobile phones around the globe. Your application makes a post request to Twilio. 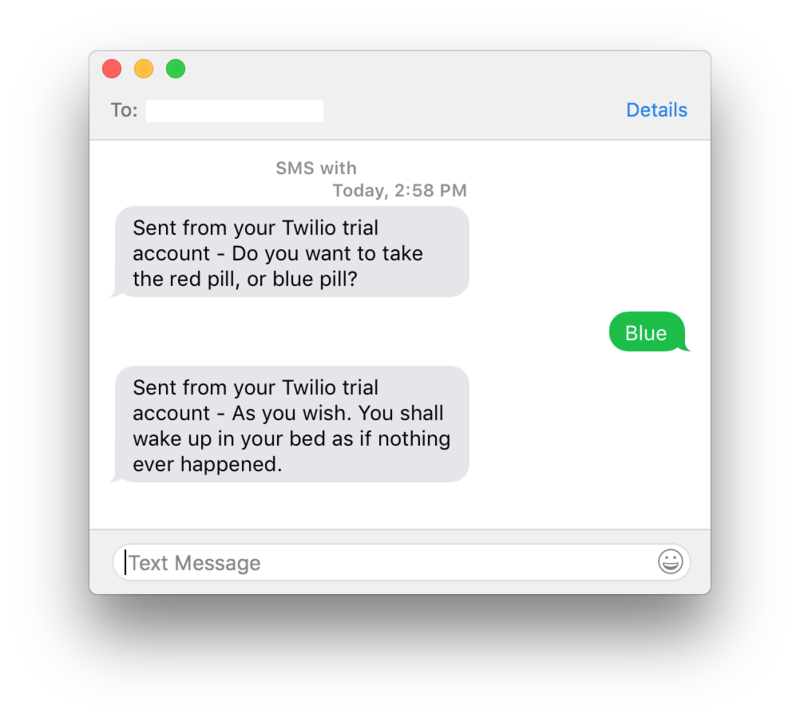 Once received, Twilio sends a text message to a number declared in the Python script, or whatever variable is declared. It’s that simple. Before you begin, you’ll need to open an account with Twilio and also purchase a number that your messages will be sent from. It’s a fairly simple process and you won’t need to spend anything for this tutorial as they give you free credits to purchase and test out their services. If you plan on integrating Twilio into your business, you will incur some costs in the future so it’d be a good idea to skim over their pricing model. Head over to Twilio.comand sign up for a free account. Once registered, you can purchase a number using the credits they give new members. For the sake of brevity, I’ll link you to their support page on How to Purchase a Number. Make sure you purchase a number that is SMS capable. Replace the placeholder values with your own information. That’s it! You should have a message from your Twilio phone number hit your cell phone shortly. You’ll see a prefix to your message if you are on a Trial account. 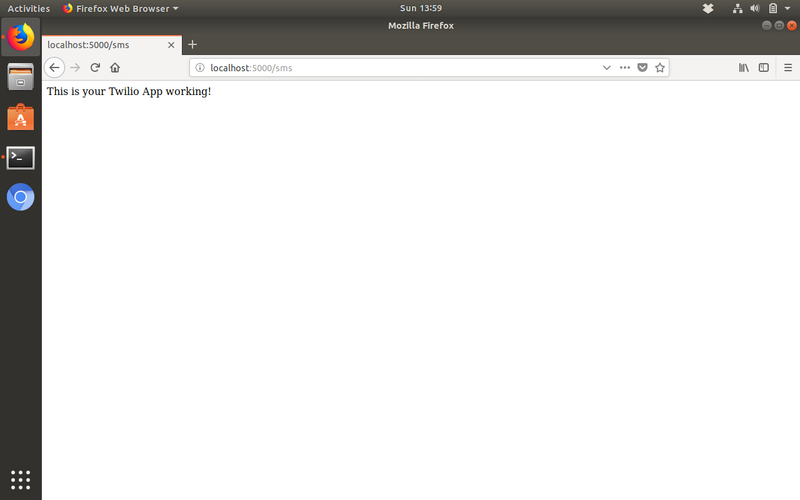 In order to receive and reply to incoming SMS messages, we will need to install Flask, setup a virtualenv sandbox, and also configure ngork so Twilio can talk to our app. Let’s begin. If you are familiar at all with Python development or have seen my last post on setting up a development environment, this should seem familiar. Lucky for us, if you are on Python 3.4+, pip should automatically be installed. If not, Google is your friend. Once installed, navigate to your directory where you are keeping this project and create a virtual environment. Once activated, you should see the name of your project sandbox prefixed in your terminal. If you are confused or ran into an issue, see one of my previous posts here. 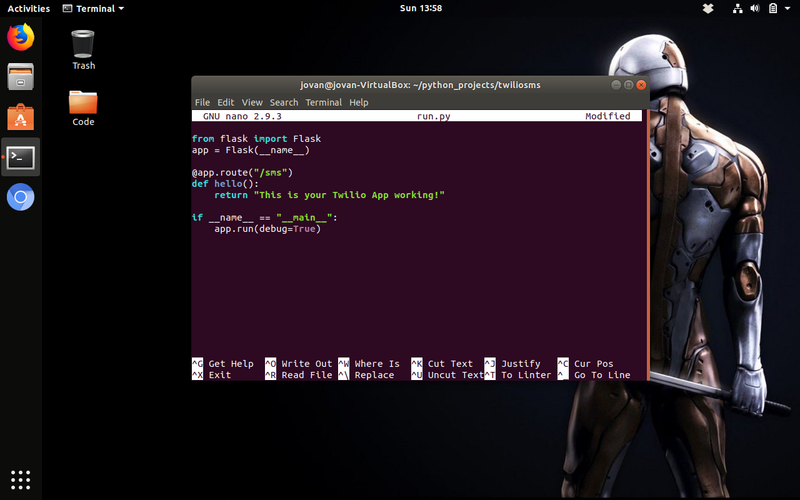 Test code for the Twilio app in Flask. 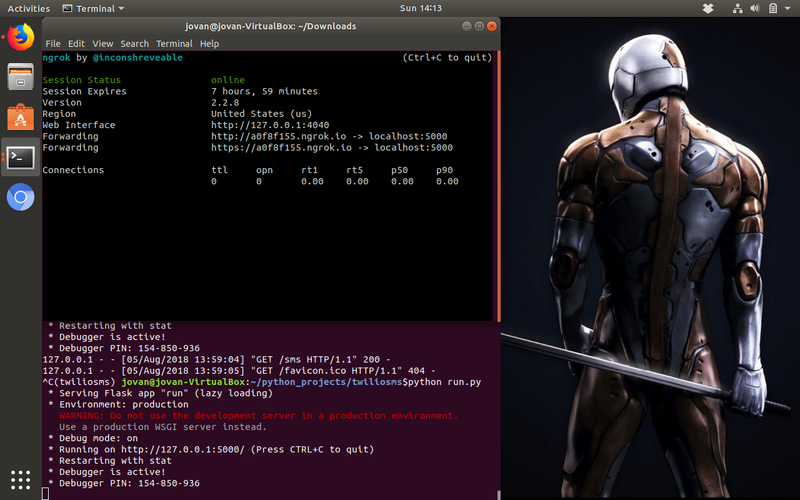 Now let’s run the script by running python run.py. What you should see if you did it correctly. When you’re working on your Flask application in your development environment, your app is only reachable by other programs on your computer. This is why your app is only available on localhostor 127.0.0.1. In order to resolve this, we can deploy our app on something like Heroku, AWS, or other cloud services, but for this specific tutorial, we are going to use ngrok. Per their own website, ngrok “allows you to expose a web server running on your local machine to the internet. Just tell ngrok what port your web server is listening on.” Once started, Ngrok provides a unique URL on the ngrok.io domain which forwards incoming requests to your local development environment. If you’ve never used ngrok, head over to their download pageand grab the binary for your OS. Ngrok gives you public access to locally hosted applications. Copy your unique public address, put it in a browser, and trail it with a “/sms/”. For instance, the address above should be “http://a0f8f155.ngrok.io/sms”. When someone sends an SMS to your Twilio phone number, Twilio makes an HTTP request to your server asking for instructions on what to do next. 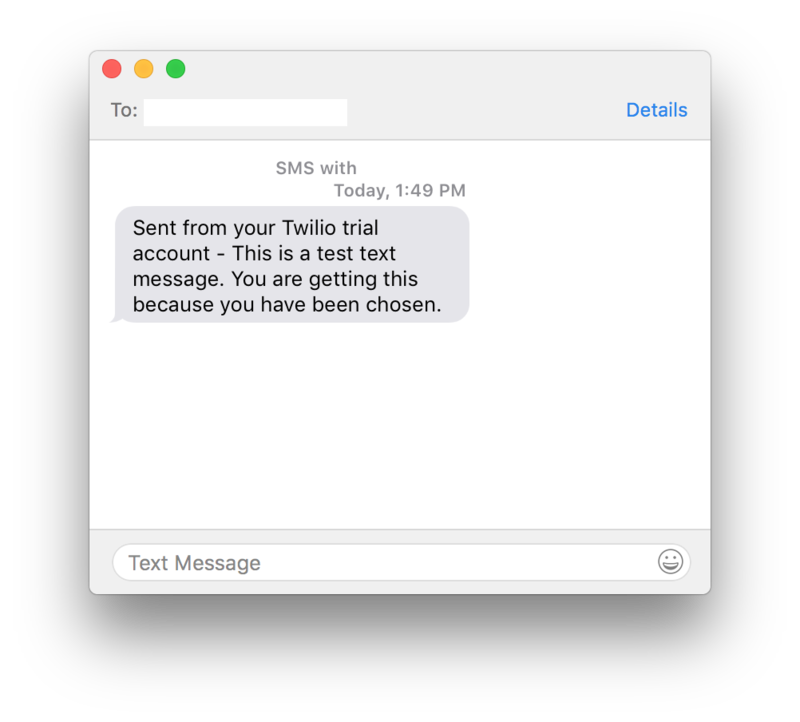 Once you receive the request, you can tell Twilio to reply with an SMS, kick off a phone call, store details about the message in your database, or trigger an entirely different action. """Respond to incoming messages with a receipt SMS.""" Feel free to edit the code above, especially the line under # Add a message.I was playing around with my code while watching the Matrix so my messages will seem goofy in the following examples. Save the file and run the python run.pycommand again. Make sure ngrok is still running and copy the custom public URL they give you. For Twilio to know what URL to grab, we need to configure our Twilio phone number to call your webhook URL whenever a new message comes in, which is what ngrok does for us. Log into Twilio.com and go to the Console’s Numbers page, click on your SMS-enabled phone number and find the Messaging section. The default “CONFIGURE WITH” is what you’ll need: “Webhooks/TwiML”. In the “A MESSAGE COMES IN” section, select “Webhook” and paste in the URL you want to use. Paste your custom ngrok URL in the Twilio Console Number’s page. Now let’s test your entire SMS messaging app by executing your two python scripts. Everything running together. You can confirm your response script is publicly available by going to the URL. You should receive your initial text, and if you reply to it, you should get the response text that you coded in your second python script. That’s pretty much it! With the knowledge from this tutorial, you can build out a fully-fledged web app that you have more than likely interacted with already. Many professions from doctors and dentists use services like this to confirm appointments, or even ride-sharing apps like Uber to confirm a user is ready to be picked up. There are many other Twilio tutorials out there that guide you through similar processes. Piece some of them together to build your own custom app!